Holy cow what a week! Monday it was so cold we thought it was December. We worked all that day in the cold. Yesterday the snow was gone and mud was the order of the day. Jake, our gathering crew of friends and family and the horses, all had to navigate the mud. I have been in the sugarhouse pretty much steady since last Wednesday. I even boild today, Easter Sunday, sharing the experience with family and friends. It has been a long, yet wonderful week. Syrup is still a nice color, no buds in sight and this is the longest season that I can ever remember! There is a lot of things to do in between batches of syrup. The tanks have to be cleaned, buckets need washed, filters get changed and somewhere in there we get to rest a little bit. 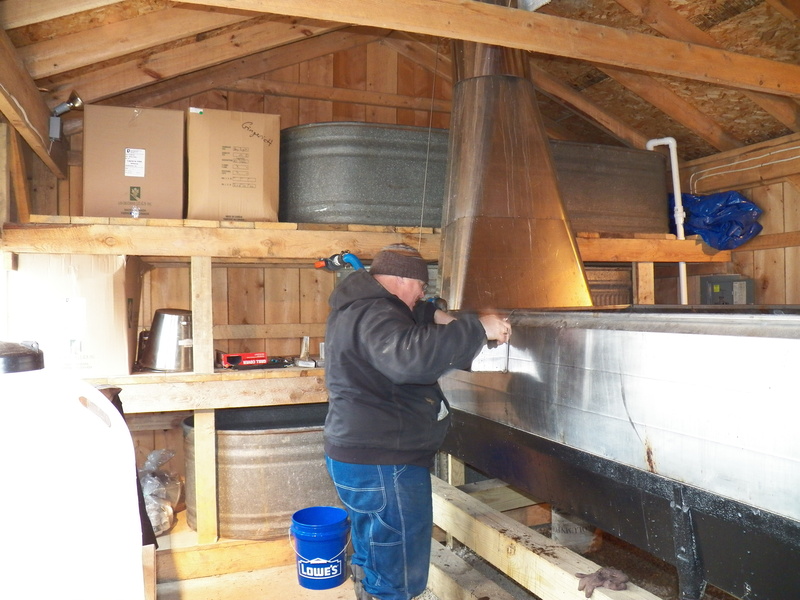 The maple sap runs are coming close together right now, as the season heads towards it’s end. The weather is perfect and those sap bags keep filling up. Yesterday, I had a short break, but only because I boiled late into the evening the night before. I had to get a few supplies for the sugarhouse. When I returned home, a few farm chores needed tended. I went out to check the sap bags at about 6pm. I found them all 3/4 full , some even more! I didn’t expect that! Today I got up very early. My chores are done and I am waiting on my helpers to arrive so we can gather the sap. I am still expecting a big day Saturday too. We will go as fast as we can, so that I can boil this afternoon. I will have to boil, just to make room for Saturday’s sap 😮 what a good problem to have! This has been a crazy syrup season. The usual roller coaster ride for temperatures is just much later than usual. We are scrambling, keeping one step ahead and make preparations along the way. Ours is a small venture, but it still takes up plenty of resources, time and energy…. not to mention all that firewood! 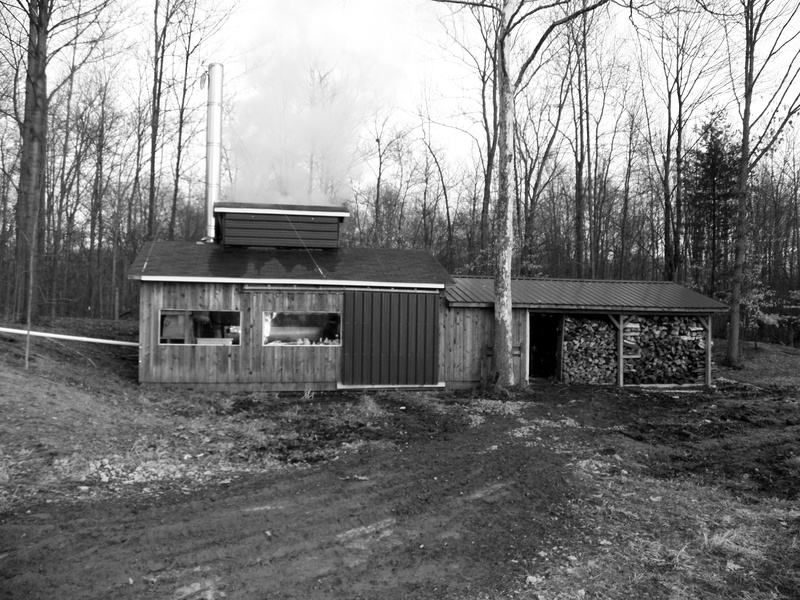 Yesterday, after taking care of a few pressing jobs, I went to the sugarhouse and began boiling the maple sap. The sap we had collected the night before. That was a long afternoon of gathering, let me tell you. The trees finally ran like mad. 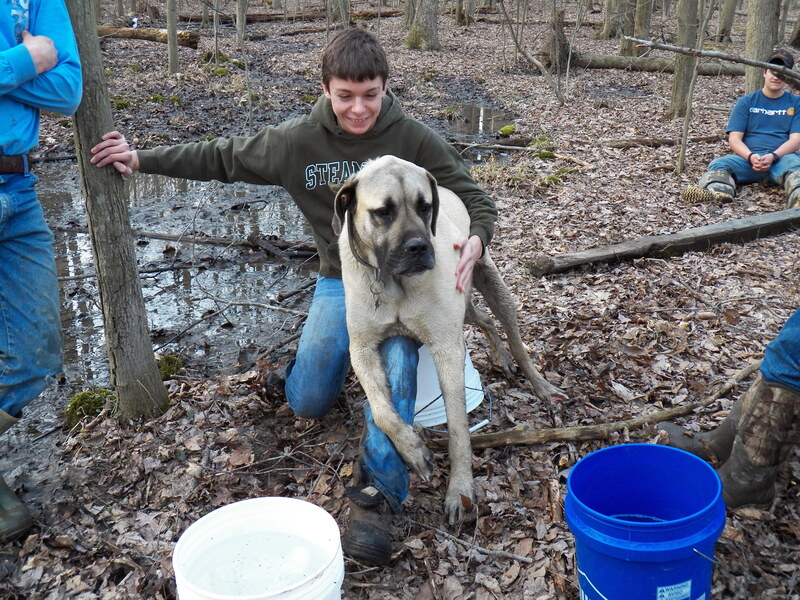 We gathered over 1100 gallons of sap. I had to leave part of the last load in the horse drawn tank until I could boil some down to make room! I began boiling at twelve-thirty yeaterday afternoon. 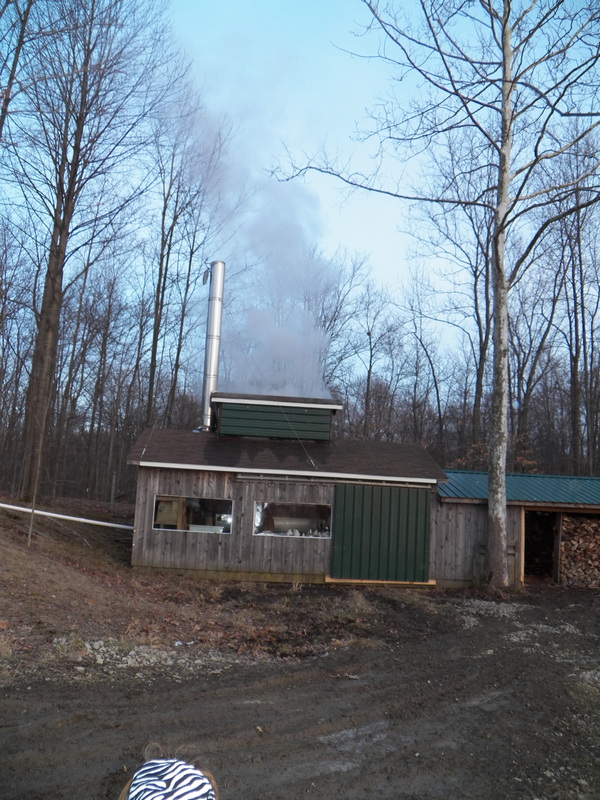 The last of the sap hit the evaporator at eight-thirty last night. I finally made it to the house at ten-thirty. It was one of our best days this season. Here it is, much later than a usual season and going as if it was late February rather than March. We even got a coating of “sugar snow” overnight. The trees continued to drip into last evening. It looks like a good weekend coming up. So far, our wood is holding out. We have used about half of our stockpile. I am sure we are in the final weeks of the season. A season that is as whacky as our weather these days. In my memory, March 27th was the lastest day I have ever gathered sap. That was the last day of the season back then, ten years or so. Things look great here right now. The weather is perfect and the trees don’t think its late spring yet. Soon the days and the nights will be warm. The trees will send the sap to the buds on the ends of their branches. That will be the end of the season. So far, the weather has kept the sap near the ground, thanks to the freezing temperatures. Our small “tree saver” spiles are running good. The bags are holding up pretty well, dispite all of our problems with them icing over this year. This young man came to our farm a couple of weeks ago. 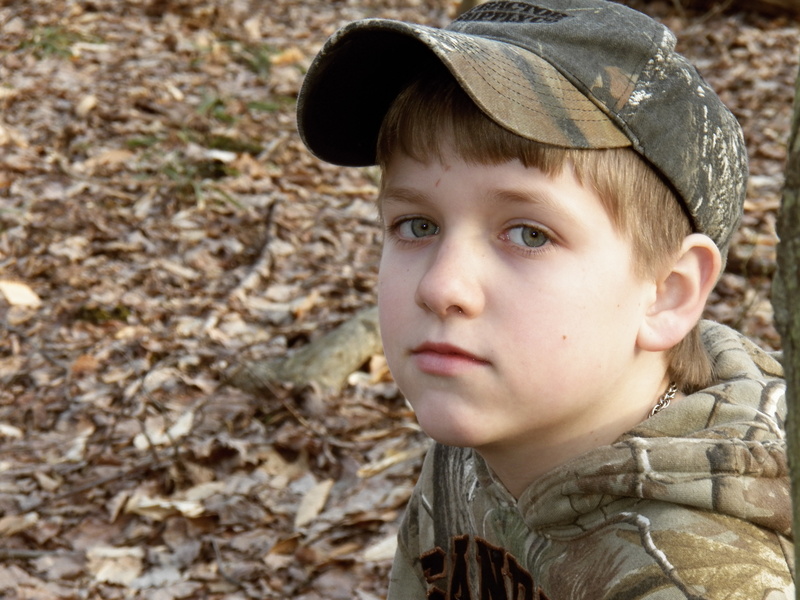 He had a big day and enjoyed the farm.Once he became comfortable, he opened up and shared stories with us. He is a good worker, especially given his age and size. I know good workers and was impressed by the “fire” in this young fellow. I am thinking it really is a journey, not a destination … this whole growing up thing. So far, I am mostly growing “old”, not so much growing “up”. I still goof off, tell corny jokes and dream of my next conquest … usually a building project! As I listened to the little guy talk, I was reminded of a saying my mother used to say, “The bigger the boy … the bigger the toy!” Yesterday, we dug a ditch with a mini-excavator. Jake and I got a lot of work done, but boy did we have fun doing it! Even the cold didn’t slow our progress… Jake, of course, now wants one 😮 I told the guy we rented it from that I sure liked the machine, but didn’t like the payment … much easier to just rent his when one is needed! I must say that there is nothing wrong with dreaming … as long as you put a plan in place and keep moving in that direction. It’s ok to switch directions, but make sure to make a new plan. I will say, there is much to be said for focusing on just one thing. I salute those who can. I will probably always be a dreamer, who gets things done, because I have a plan. I dreamed I wanted to be a farmer. I ran into several roadblocks along the way, but just changed routes and kept heading towards my goal. I am surrounded by all the things I love along with an understanding wife, who sometimes shakes her head, but loves me anyway. My advice is to follow your heart. Dream big, reach for the stars and don’t give up. This is the advice from an old little boy who dreams big. 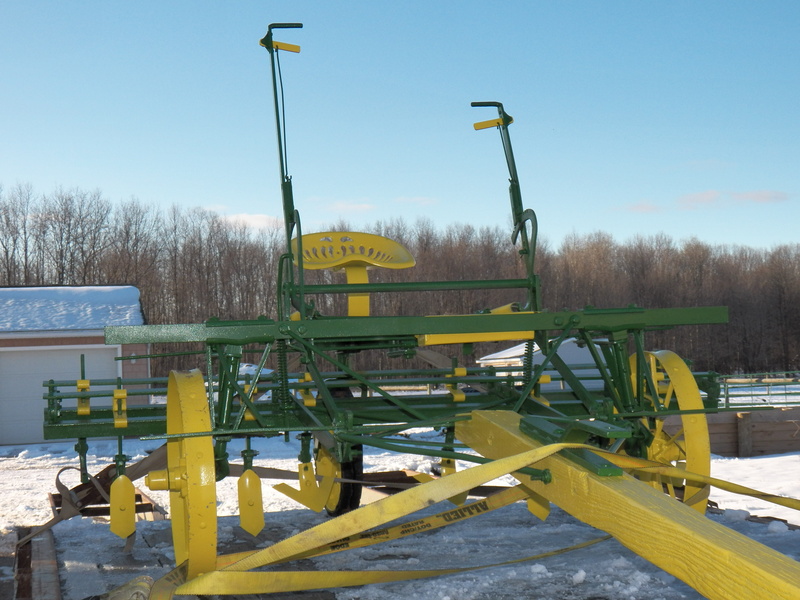 John Deere cultivator gets a new life! The snow on the ground makes a statement of it’s own, but the warm days of early summer will soon be the “order of the day”. I will be ready, I think. I need to adjust the sweeps and get everything adjusted in accordance to my planter, but other than that, this machine is ready to go! I like the old things. This simple, yet effective, piece of machinery will keep the weeds out of my corn. I will have to use it of course, but it sure beats hoeing. I do have an old McCormick-Deering 2 horse, 1 row cultivator too. It is serviceable and works well too, but I just decreased my time factor, by being able to cultivate two rows at once! The McCormick-Deering cultivator has a set of “disc hillers” that I use to hill potatoes, but also to roll dirt on the corn stalk roots the last time that I cultivate. The dirt helps the corn stand up on windy days. It also buries small weeds growing between the plants. It’s a bit of work, but beats spraying poision on my fields. Wow, what a difference a year makes! This time last year, we were done with maple syrup and starting to plow and prep the fields for planting. We got some oats in early and the growing season was off to a good start. Today the high might make 32, but we are more like winter than spring. The sap is doing that thing where it drips on the trees in the sun, just enough to freeze up by nightfall, leaving a big ice cube where sap should be. We are waiting on Mother Nature, she is the one in control! Snow covers the muddy ground about 6 inches deep. The sun is out and the little lambs think it’s a great day for playing out of doors. We did a bunch of chores, cleaned manure and even made plans for a clean up job in the basement … man I am getting desperate here 😮 I would much rather be in the sugarbush! It is a wonderful thing to have friends that you can count upon. I am thankful for friends who hold me up. The understanding of someone close to you, is often enough to get you through a tough time … even if they don’t say a word. I spoke to a friend of mine this morning. He has been dealing with some life chaging events for quite a while now. A weaker man would have crumbled, possibly given up. My pal, however, keeps finding the better things to think about. Sure, he has down days, but he puts those days aside and dwells on the good. In the photo, King tries to sit on Ben’s lap. The boy is not so sure, but the dog knows who he can count on. Trust is a wonderful thing. I think sometimes it takes getting your heart broken, or having your trust violated, to make you understand just what a precious gift trust can be. I guess my message is… be the friend..that you want others to be!